1. Everyone is invited to play! There are no requirements or restrictions on what products you can use to create your challenge entry. 2. You have until noon on Thursday, November 1st to link your entries for this challenge below. 3. Please link directly to your entry photo or your specific blog post featuring your project, not a general link. We reserve the right to remove invalid links. If you're uploading to a public forum, then use the keyword PPC90 so we can find you! 4. Please fill in your name (not the name of your card or the name of the challenge) as the caption/label within the linky tool. 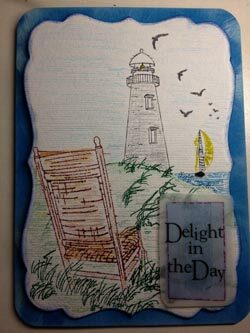 and stop Scrapbook Paradise and try the challenge..
What a peaceful scene, Judy :) Love the sentiment, too - so perfect for sitting back & relaxing by the shore! Thanks for playing in Paradise with us again! I love yoru hand colored card work. So pretty. Fantastic card Judy, I love how you used those two stamp to create this fabulous scene. The sentiment is perfect too. Thank you for joining us for Playing in Paradise. I love the sketchy feel of this card. It's also very relaxing! I wish I could be sitting on a beach instead of in all this snow! Its really nice to see you DRAWING - very artistic! Sure keep missing you!